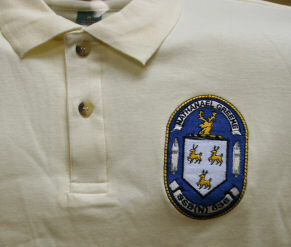 Here are some embroidery samples for polo shirts, denim shirts, denim and microfibre jackets. 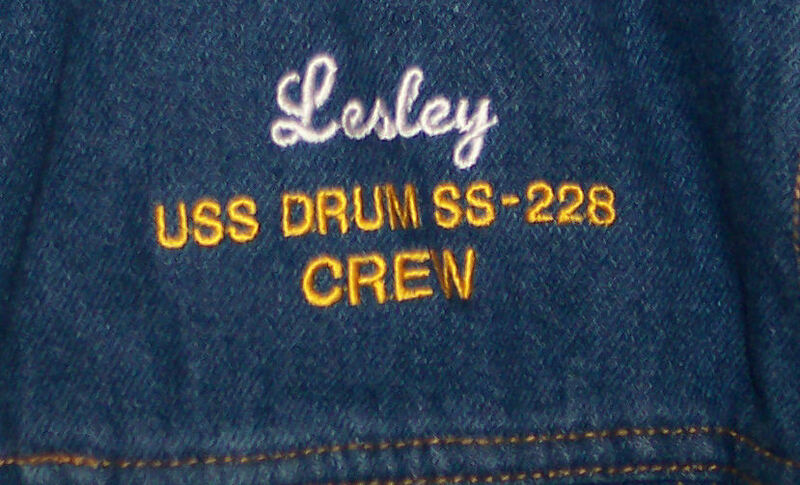 In addition to the sample of the back shown above, we can do the 9" USSVI Logo or a large set (12") of dolphins. 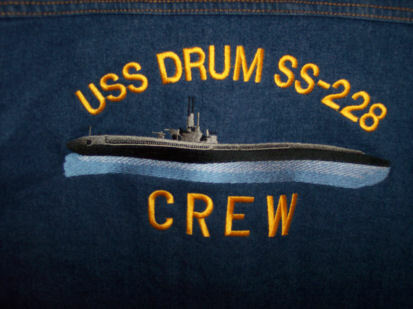 This is direct embroidery and not a patch. Back graphics are $20. To put 1-3 words in large letters or a boat name under the graphic is $7 and 1-3 words above the graphic is $7.00 Boat names under this are $7 each. These designs can be put over the left breast front in smaller sizes and boat names are $2 each. Knit Shirts. A neat reunion idea. 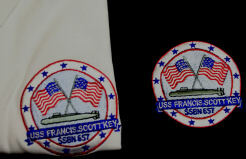 Great example of a custom job we recently did for the Nathaniel Greene and Francis Scott Key. The embroidery on the shirt is not a patch. Direct Embroidery. 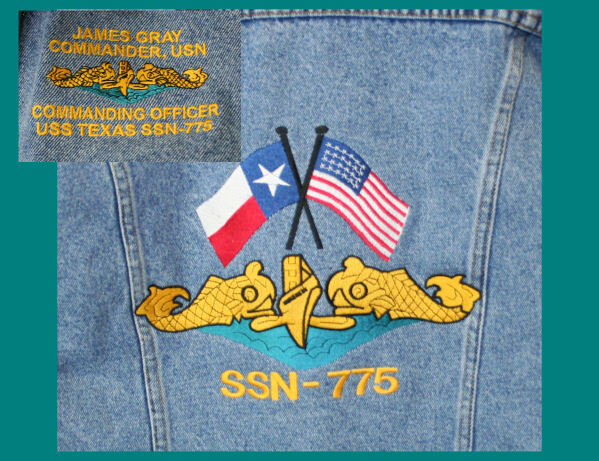 We can also design and do custom patches. 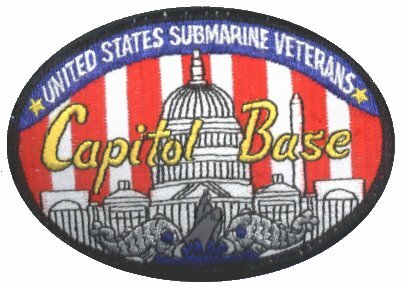 We have done the Sea Robin, Lockwood Internet Base and Capitol Base patches. The Blue Nose, 41 for Freedom, Bottom Gun patches are of our design. Most of these are in stock and we do have the biggest selection and most flexibility on custom orders of all of our merchandise. If you don't see what you want, give us a call and we will let you know if we can do it. We can print custom graphics and are happy to quote the first time digitizing cost on any of our items. 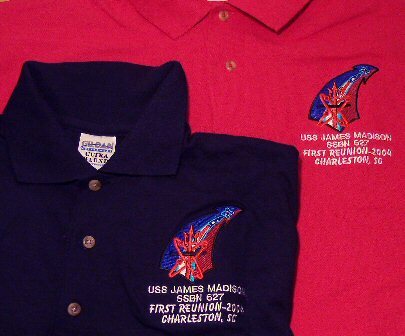 We also offer other clothing items for custom embroidery. For Ball Caps. We also can add side or back embroidery at $7.50 each. It is time consuming for the embroider to manually hoop the cap and re-install it on the machine. Quantity discounts are available for reunions and bases.